So yesterday was all about the ladies and today is all about the men in our lives. I've always had a difficult time shopping for my dad, brother, grandpa and now husband. There doesn't seem to be as many wants/needs on their Christmas lists as the women in my lives. 1. Just like I love my monograms, I love a man who does too. What man wouldn't want to mark their meat with this Williams Sonoma brander? 2. a hot key chain for that hot man of yours. Or maybe just your dad? 3. Have you ever been in a single guys apartment? What comes to my mind is empty walls and black leather sofas. I had my brother in mind when I picked this Ork Boston poster, and they come in lots of other cities too! 4. Love that all the new gloves out there have that magic finger pad so you can use your phone with gloves on. Genius. These ones are from Patagonia. 5. Who doesn't love Top Gun? Gotta have the Ray Ban aviators. 6. Everyone has an iPod, iPad or something along those lines these days and I think these retro style headphones are so fun! 7. Another monogram, oops. Love this Colby Leather Toiletry Case, it's perfect for the traveling man. 8. OK so maybe not every guy will love this cute brass duck bottle opener, but the women in their lives sure will. 9. Stylish birch storage boxes for the guy in your life to stash all his stuff. I love these ideas. I have no problem coming up with ideas for my husband but I'm always lost when it comes to my brother and dad. I think those gloves would be perfect for my brother! Great picks I really love the monogrammed leather case!! Very Handsome! Vicki from French Essence has offered her duo of books to 2 winners!We are on our 5th day of Holiday Giveaways with 4 events being open! 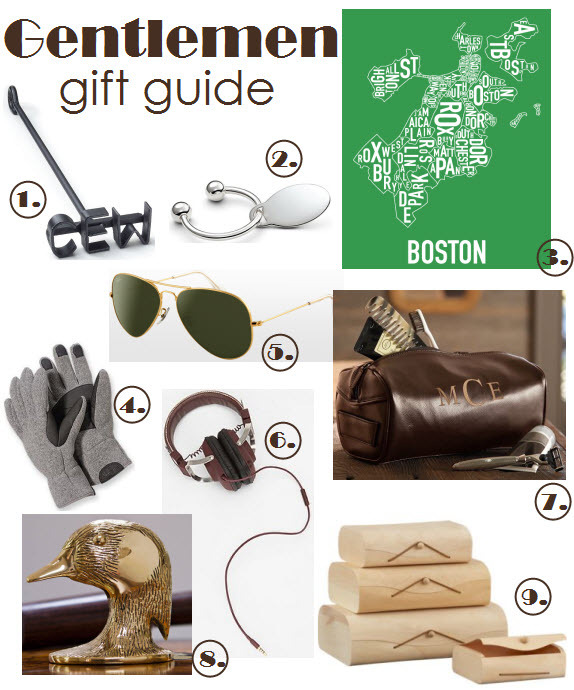 love the gift guides!! I need all the help I can get! great Picks! Isn;t it SOO hard to pick out stuff for guys?! LOVE that Boston map - might just have to pick that up for my hubby. Never seen it before - thanks!